Which business insurance do I need? Making sure you have the right business insurance is important, but with so many products to choose from it’s hard to know where to start. 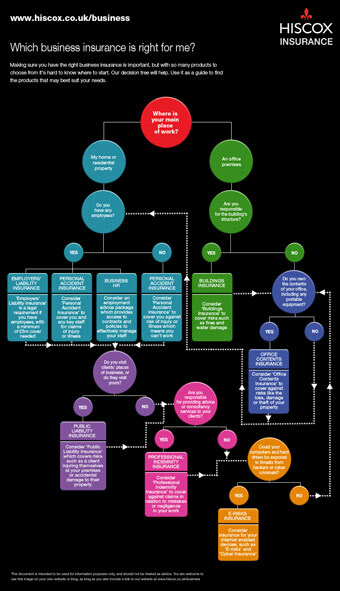 That’s why Hiscox have created an easy to follow decision tree to help you understand what insurance you may need. You might find this Contractors' Guide to Insurance helpful too. All of the products on the decision tree are available online at www.hiscox.co.uk/ContractorUK or over the phone on 0800 2800 359. Policies are underwritten by Hiscox Underwriting Ltd on behalf of Hiscox Insurance Company Ltd, both of which are authorised and regulated by the Financial Services Authority. This promotion has been authorised by Hiscox Underwriting Ltd.